I’ve said it before, but I’ll say it again, fried chicken is probably my favorite meal. It has been since I was a youngster, and it still is to this day. I’ve made plenty of varieties of fried chicken, but this one may have sealed the deal when it came to the juicy interior, and crispy exterior. It has plenty of spice as well, but not too overwhelming as my kids did not complain about the heat. I took a different approach on this one, dunking it into a wet mixture before applying the spiced flour, and I think that is what made this spicy fried chicken the real deal. I know, sounds like a lot, right? It’s not too bad, and it actually goes pretty fast as for the most part you dump the ingredients into some bowls and mix, then fry to your hearts content. Start by making the wet mixture. To a large mixing bowl, add all of the wet ingredients, and mix to combine. Using some cooking latex gloves if you have them, and add the chicken pieces, massaging into the wet mixture. Once all of the chicken pieces have been coated, add the bowl to the refrigerator, and chill for about 20 minutes. During this time, make the dry mixture. To another large mixing bowl, add all of the dry ingredients, and stir to mix well. Now, heat up a large cast iron skillet, enough to hold the chicken pieces, and add the canola oil, heating on medium heat until the temperature reaches 350 degrees. 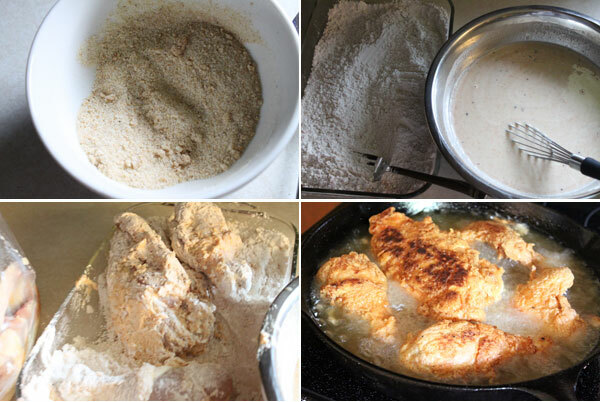 Remove the chicken from the refrigerator, and taking a piece out at at time, add them to the dry mixture, tossing to coat, then add the coated chicken to a baking sheet. Repeat with remaining chicken. Let the dry mixture set on the chicken on the baking sheet for about 10 minutes. Once the oil is heated, carefully add the chicken to the heated oil. Tongs work well in this case. I like to add the breasts to the center, then thighs, wings, and drumsticks. Keep an eye on the temperature, maintaining that 350 degrees. This is important. After about 10 minutes, or so, turn the chicken pieces with tongs, being careful not to splash the oil. Cook for about another 10 minutes, then check the temperature of the thickest part of the breast. You want the temperature to reach 165 degrees, then you know you can pull the remaining chicken pieces to serve. Place on a paper bag, or paper towel to let any excess oil drain prior to serving. I cannot serve fried chicken without serving them with crispy waffles. My kids are now hooked, so that’s how I serve them. Lay a waffle, then top with your favorite part of the chicken. I go breast. I drizzled a bunch of extra hot sauce on mine, along with some pickles. 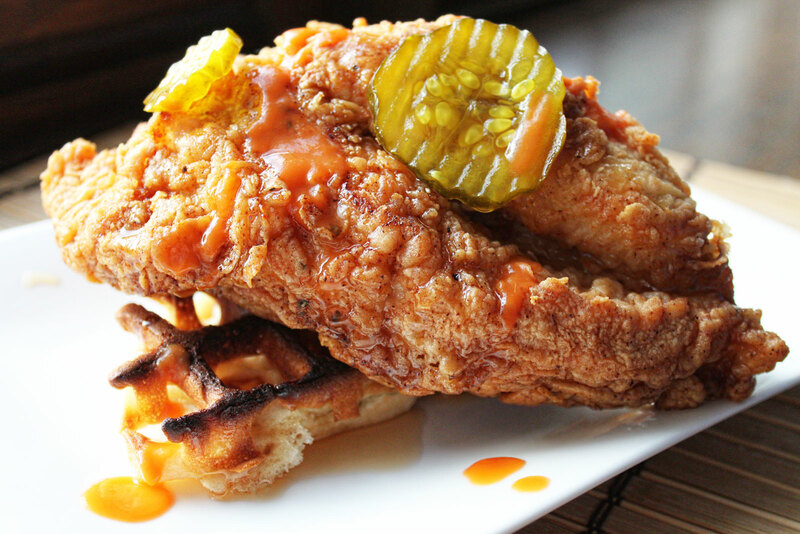 Who knew pickles, and waffles would pair so nicely with spicy fried chicken!? The result was nothing short of amazing. Super juicy on the inside, and perfectly crisp and spicy from all of the spices in the wet and dry mix. I’m glad I tried going the wet route with this recipe. It was a game changer. Hope you enjoy!